St. Aloysius Gonzaga the patron of our camp and retreat house, and Our Mother of Perpetual Help is the patroness of our chapel. 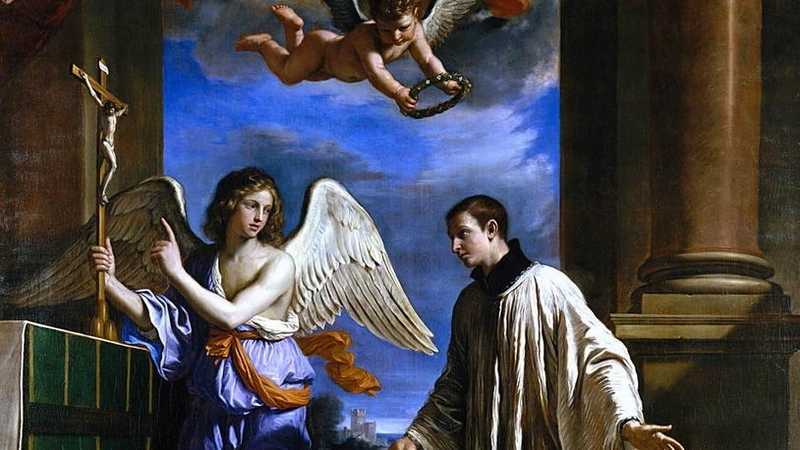 St. Aloysius Gonzaga is the patron saint of our camp and retreat house. He is a model for our youth since he showed great innocence and holiness at an early age. He became a Jesuit and is therefore a fitting patron for our parish where the Ignatian exercises are made. He practiced much self-denial, particularly in the virtues of humility, obedience, and poverty. He died at an early age already attaining to sanctity at age 24. We rely on his intercession for a fruitful apostolate of our camps and retreats. The miraculous image of Our Mother of Perpetual Help is presently located in the Church of St. Alphonsus de Liguori in Rome. The image shows Our Lady holding her divine Son. He is grievously afflicted at beholding the cruel instruments of the Passion that the two angels are presenting to Him. Mary’s countenance is one of sorrow and compassion proclaiming her role as the Co-Redemptress and Mediatrix of all graces. As Mother of God and our Mother she is a fitting patroness for our retreat center where people come from near and far to develop their spiritual life. Our Mother is ready to help with many graces to bring souls to a greater and more intimate union with her Divine Son. Each Saturday morning following Mass we honor her with the Mother of Perpetual Help devotions which are said before her image in order to draw down the many spiritual and temporal blessings of which we have need. 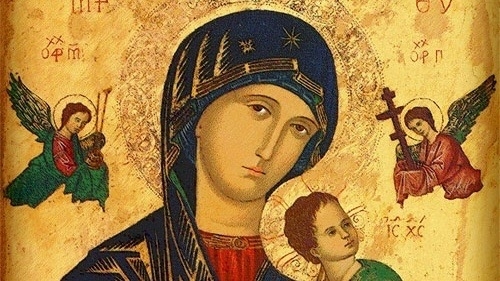 The icon of Our Mother of Perpetual Help can be traced back to the 14th or 15th century in the island of Crete. A merchant had taken the beautiful picture from the Church in which it was venerated and set sail for Italy. He then became grievously ill and calling his friend to his bedside besought him to promise to have the image placed in a Church in order that it may receive the homage of the faithful. The man did not keep his promise and retained the image in his home where he lived with his wife and daughter. After the man died, Mary appeared to his daughter and indicated the title she wanted for the image and the location where she wanted the picture enshrined. On March 27, 1499, the image was escorted in a solemn procession to the Church of St. Matthew on the Esquiline Hill, between the Basilicas of St. Mary Major and St. John Lateran. During the procession, a man who had been paralyzed for some time was immediately healed when the image passed near the house in which he lay. The picture hung in St. Matthew’s Church until 1798 and innumerable favors were granted to the people who prayed in its chapel. Then at the time of Napolean Bonaparte, the French army entered Rome and the Church of St. Matthew was destroyed. Fortunately, the Augustinians who had care of the Church saved the image, and it was placed in a side chapel of the monastery of Santa Maria in Posterula. In 1853, Pope Pius IX requested that the Redemptorists establish a house in Rome. They chose a property located between the Lateran and St Mary Major. With the permission of the Pope, the image was returned to the site where it had been enthroned for almost three centuries. During the translation which took place on April 26, 1866, two miracles took place. A boy with meningitis was cured and the paralyzed leg of a young girl was healed. Since then innumerable copies have been made and devotion to Our Mother of Perpetual Help has spread rapidly throughout the universal Church.